We welcome your questions, comments, and inquiries about our company. Enter your comments in the template provided below or contact us according to the following directory. One of our representatives will contact you shortly. 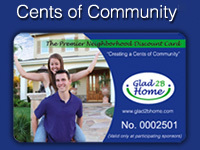 We're all creating a Cents of Community!